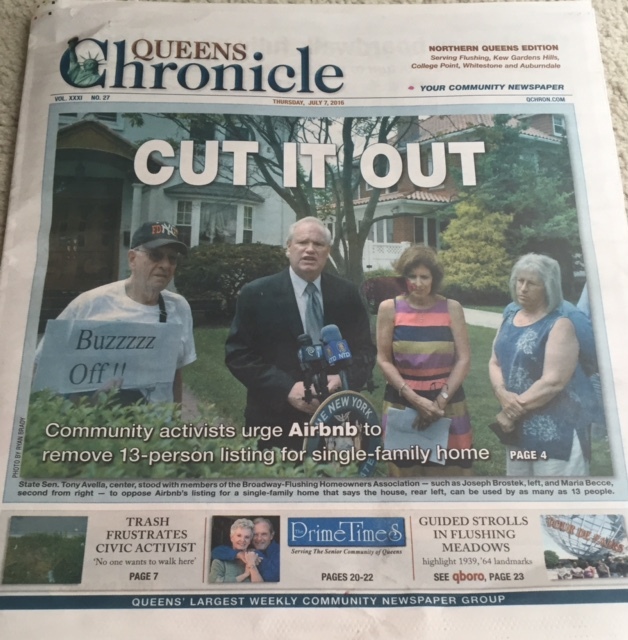 State Sen. Tony Avella (D-Bayside) stood with members of the Broadway-Flushing Homeowners Association last Friday to call on Airbnb to remove a listing for a single-family home that says the house can accommodate 13 people. The listing on Airbnb’s website for the house says that six bedrooms are available, and that the entire house can be rented for large events and groups. The Rickert-Finlay Covenant of 1906, which limits what homeowners in the area can do to their property, does not allow houses to be used for apartments or multiple families. And because the covenant is not enforced by the Department of Buildings, BFHA has instructed its lawyer to file a cease-and-desist order for the house. Becce added that the association first discovered an Airbnb listing for the property in March, which the company took down before the existing listing for the house was posted. Avella, who sent a letter to the company on Wednesday urging it to take down the listing, indicated that he may introduce legislation to prevent similar incidents from happening in the future. In an emailed statement to the Chronicle, Queens Airbnb Host Club President Lee Thomas responded to Avella’s call for the listing to be removed. The maverick senator previously pushed legislation that would allow neighborhood residents and civic associations to file deeds with the DOB, which would enforce them, but the bills — which were introduced in the City Council when he served there, as well as the state Senate — didn’t pass.